The Target Saver: Jane.com:Funny Laundry Signs | Free Shipping - Was $22.99 - Now $12.99 + Free Shipping! Jane.com:Funny Laundry Signs | Free Shipping - Was $22.99 - Now $12.99 + Free Shipping! 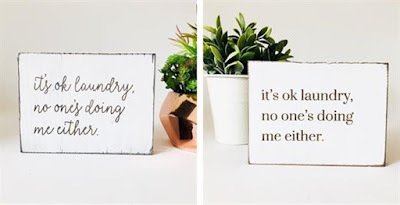 Now thru Saturday 8/25 , you can grab these Funny Laundry Signs from Jane.com for just $12.99 shipped (reg. $22.99)! There are 2 different quotes to choose from. These rustic farmhouse style signs are the perfect size for a shelf or window sill and they also make a memorable gift. Shipping is FREE with this item! Offer ends Saturday, 8/28.